The Brinkley Jazz by Clarks collection is a sporty women's flip-flop that is built for walking. Its soft fabric upper has an adjustable hook-and-loop closure making a custom fit, while the Eva foot bed is ultra-lightweight adding flexibility and comfort. Slip on for the beach, a sporting event or cookout, these flips flops will soon become a go-to. A carefree summer flip-flop with clarks collection aesthetics and comfort. made with honey synthetic straps with hardware accents, it pampers the foot with soft textile linings, a burnished eva footbed with cushion soft layers, and a tpr traction outsole. looks great with jeans, shorts or swimwear. The arla marina from Clarks cloudsteppers feature cushion soft technology for unbelievable comfort. The toe strap feels soft against your foot while keeping it supported. The eva midsole is ultra-lightweight and makes the sandals ideal for walking long hours or standing and chatting at a barbeque. Cool and casual, these Brinkley flip-flops are your go-to look for warm-weather style with an adjustable strap and signature Clarks comfort technology Founded by the British Clark Bros. in the early 1820's, Clarks footwear has been a step ahead of the game with their international renowned footwear. Manufactured in England, their casual shoes, outdoor boots, sandals and dress shoes are preferred by both men and woman that want a pair of shoes that are timeless, durable, stylish and most of all comfortable. The broad selection of Clarks women's shoes includes clogs, leather wedges, trendy heels, embellished mary jane dress shoes, comfortable flat leather sandals, trendy ankle boots and fashionable athletic sneakers. For men, Clarks footwear offers leather oxfords, dress shoes, slip-ons and moccasins. Leather outdoor boots and sandals for every occasion. Clarks shoes also has an array of shoes for both boys and girls that are comfortable for the growing kid. At our store we offer a broad selection of Clarks shoes for every occasion for both men and woman. Clarks bestselling flip-flops are a hit with women for their carefree style and renowned comfort. made with comfortable synthetic straps, smooth synthetic linings, and a tpr outsole, this thong sandal from the clarks collection is a treat for summer feet. The brinkley keely is an exclusive flip-flop thong from the Clarks collection. It exemplifies truly carefree summer dressing with it's fun colors and perfed upper. Offered in synthetic uppers with an adjustable hook-and-loop closure, synthetic linings, printed eva footbed, and rubber outsole. This women's flip flop brings a beachy vibe to everyday wear. The Tresca Track is a sporty offering from the Clarks collection. This slide is perfect for days at the beach or walking around! the synthetic uppers pair up with cushion soft technology to create a comfortable sporty slide to wear all summer long. Clarks Sandals for Women - New Range! 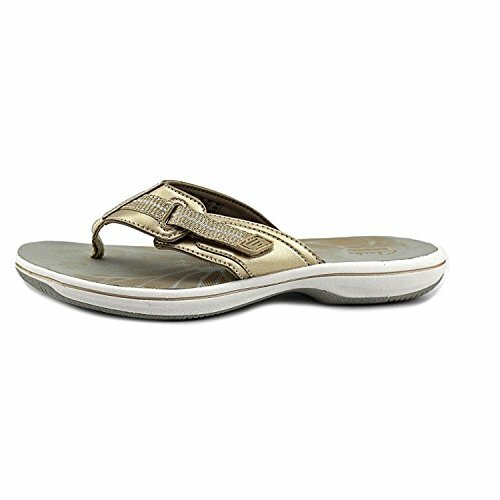 For more information about the Clarks Women's Breeze Sea Flip-Flop visit: http://bestproductsv.com/clarks-womens-breeze-sea-flip-flop Thank you for watching! Compare prices on Clark Flip Flops For Women at ShoppinGent.com – use promo codes and coupons for best offers and deals. Start smart buying with ShoppinGent.com right now and choose your golden price on every purchase.